The mower cuts grass or hay. The horse-drawn mover was developed in the 1850's and usually came with a 4-foot or 5-foot "cut". The knives can also be held vertically for going to or from the field. They can also be raised or lowered to cut at different heights. By 1920 there are many 6-foot and 7-foot cuts and a few 8-foot cuts. By the 1930s gasoline engine powered mowers were more common. First developed in the 1850s they replaced the scythe. 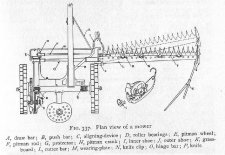 Far faster, it stimulated the demand for many of the other innovations in farming implements as much larger acreage could be harvested with the same amount of labor. Few crops grown on the farm can be as completely handled by machinery as the hay crop. While the investment necessary to provide more or less complete equipment may seem large, the investment pays for itself not only through a saving in labor but through value added to the crop by promptness in making and saving it. The mover converts the curvilinear motion of the ground wheels into the rectilinear motion of the knife. Transmission by gears alone is the most common method. The large gear is keyed to the main axle, and meshes with the small spur gear on the secondary shaft. The large beveled gear on this shaft in turn meshes with the beveled pinion on the counter shaft. These gears are usually of such size that the pit man wheel revolves about twenty-five times for each revolution of the ground wheels. 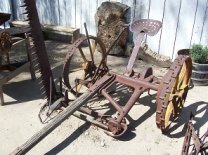 Some mowers are provided with another pair of gears and thus take three steps to multiply the motion, and still others have a third pair of gears so arranged as to make it possible to give two different speeds to the knife. This is some advantage in cutting thin grass, wheat stubble, etc., as such mowing does not require the knife to be run fast. The cutter bar and the knife guards are placed three inches apart, and the knife has a travel of three inches each way. The knife rests on wearing-plates. The ledger plates is that part of the guard against which the knife cuts the grass - the other blade of the shears, so to speak. The edges of the ledger plate are serrated that they may better grasp and hold the grass. It is essential that a close shearing action be maintained between the sections and the ledger plates. The levers for raising the cutter bar should be easily manipulated. The foot lever should raise the bar high enough for turning. Some levers will bring the bar to a vertical position - a thing to be desired if one is cutting in new ground where stumps and trees are frequent. The tilting-lever for throwing the guards up and down at the inner and outer shoes will make it possible to cut high or low. The size of mower is determined chiefly by the width of the cut, although the size of the truck may vary for the same width of cut. The 5-foot cut was the standard, with the 4-foot cut common. By 1920 there are many 6-foot and 7-foot cuts and a few 8-foot cuts. By the 1930s gasoline engine powered mowers were more common. The left wheel drives a gear box which powers the cutting. The left back pedal engages the drive shaft. The power is transmitted down the shaft to a flywheel. A piece of wood, which is no longer there, connected to the mower blade. The right back handle and pedal swings the mower vertical to allow for going to and from the field. The right front handle controls the angle of the mower to the ground. The hitch pole is setup for 2 horses that would be walking to the left of the rows now to be mowed.